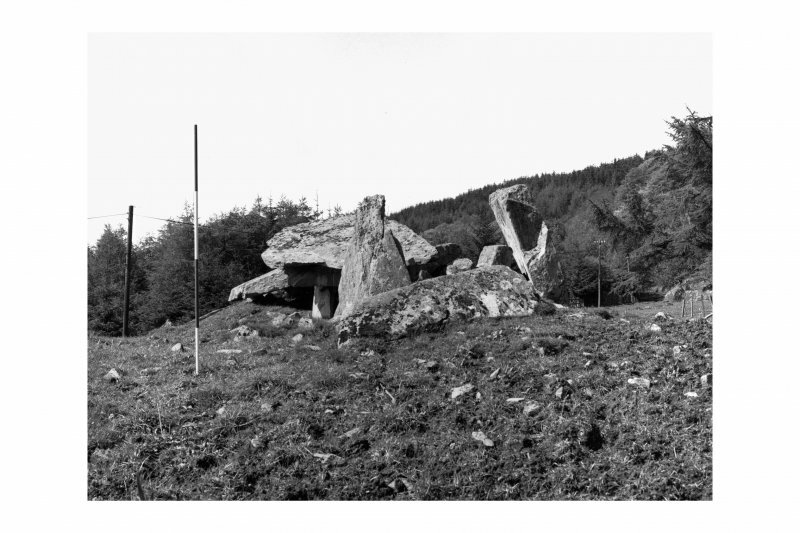 Clyde group chambered cairn: There is a certain amount of grass-grown material remaining, but the original dimensions are difficult to estimate. On either side of the chamber there seems to be an edge which would suggest a width of 44'. In front of the chamber there is certainly no cairn material more than 10' from the entrance: 35' from the back of the chamber are the foundations of a square building obscuring the cairn edge. The chamber, entered from the NE, is made of large blocks of stone. It is 16' long by c. 3' wide. Mapleton (1868), who excavated it in 1864, gave its greatest height as 8'3" so there must now be 3' of debris in the chamber, which was divided into 3 compartments, 3'4", 5'2", and 4'8" long, by two septal slabs 2'2" high - not now visible. The two very large capstones are displaced. A cist, empty in 1864, measuring 4' 2'8" x 2' deep, lies 7'2" behind the chamber. 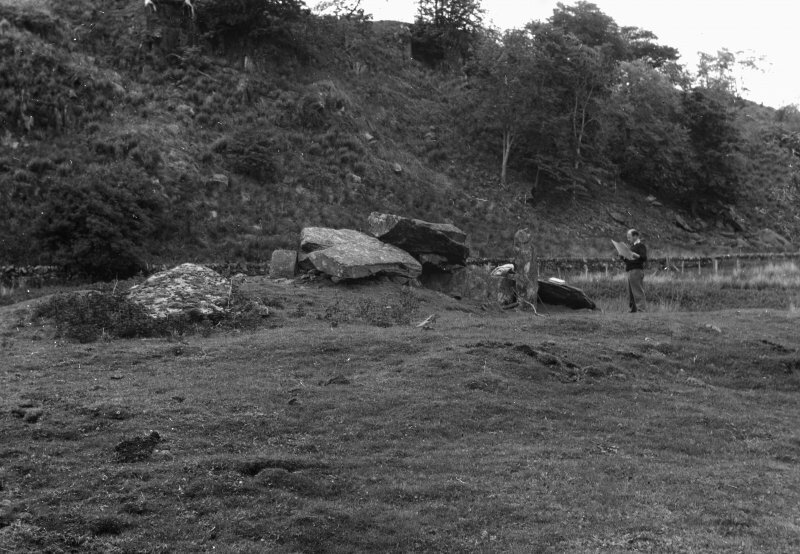 A large capstone, 7'7" x 4'2", lies displaced beside the cist. As well as cremated burials, artifacts found include a beaker sherd - in the West Highland Museum, Fort William (Accession no: 248) - and flint scrapers, cores, and flakes - in the National Museum of Antiquities of Scotland (NMAS - Accession nos: EO 1005-10). A S Henshall 1972; R Mapleton 1868; M Campbell and M Sandeman 1964. Visited by OS (I A) 24 May 1973. NR 8079 9649. The remains of a chambered cairn generally as described and planned by Henshall. The poorly-preserved cist is now filled with debris and the edge of the cairn has been further mutilated by ploughing. Visited by OS (T R G) 15 April 1977. 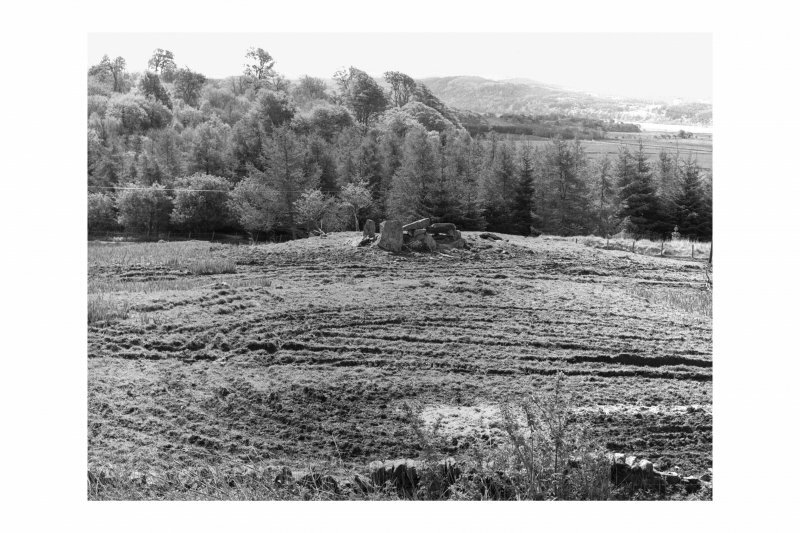 Situated on a low ridge in rough grazing 150m NW of Kilchoan Lodge there are the remains of a chamber, but only a small amount of the enclosing cairn survives, the remainder having been robbed to build the nearby walls.1 The chamber, which was excavated by Mapleton in 1864,2 is entered from the NE end. It comprises three compartments, divided by septal slabs, which are no longer visible, the rear two compartments still being partly covered by capstones; a displaced slab in front of the entrance was probably the outer lintel (2m by 0.75m and 0.2m thick). The sides of the outer compartment are formed by pairs of large slabs, one set within the other; the outer slabs, which are in effect the portal stones of the chamber, stand to heights of 1.65m and l.45m, the lintel doubtless originally spanning the tops of these two stones. 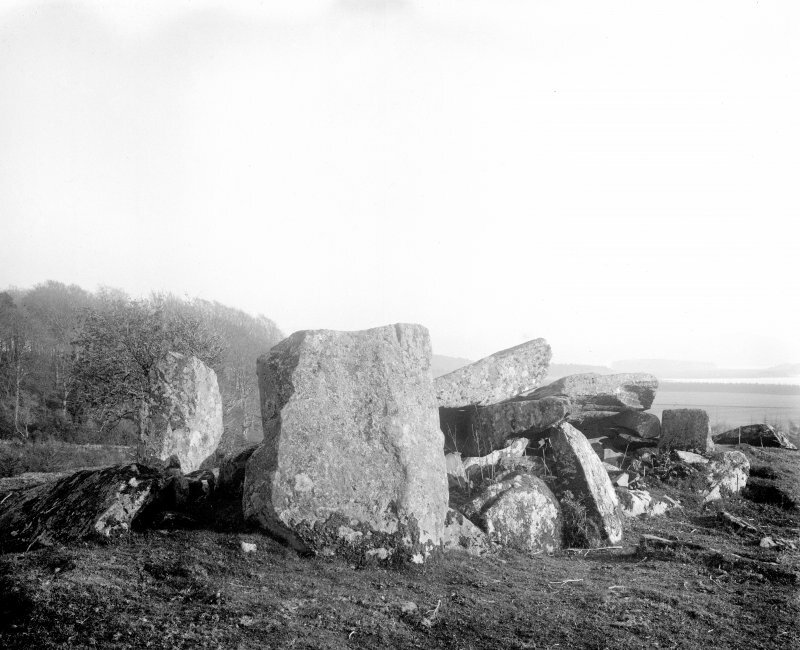 The chamber measures 4.8m in length overall, and, as Mapleton recorded a height of about 2.5m from floor to capstones, the chamber must at present be filled with debris to a depth of about 1m. The three compartments measure 1m, 1.6m and l.4m in length respectively from front to back, with the septal stones standing to heights of up to 0.66m; the end-slab is about 0.6m high and rises above the adjacent side-slabs of the rear compartment. The three capstones that still span the chamber measure 2.8m by 1.6m and 0.35 m in thickness, 2.lm by 0.55m and 0.2m in thickness, and l.95m by 1.55m and up to 0.25m in thickness; it is possible that only the central one of the three remains in position. Mapleton's account of the material found in the three compartments is unusually full for its time. In the outermost he found a firm compact white layer 'full of charcoal' extending over the whole of the interior; on this layer there were deposits of burnt bone, particularly along the sides and at the corners. A finely made flint object (probably an end-scraper) was recovered at the centre. In a sandy layer sealed by this firm upper layer, he found two 'oblong flint implements', half a rounded scraper, which he described as being of cornelian, as well as several unfinished implements and flint flakes. In the centre compartment large flat stones were placed in such a way as to form 'recesses, in which were burnt bone'. The objects recovered included a round stone, an unworked 'leaf-shaped' flint flake, as well as flakes and chips of flint. In the filling of the innermost compartment Mapleton found a portion of what is probably a Food Vessel and some unburnt bones, perhaps the remains of a secondary burial. Beneath the rubbish there was a rough paving of stones, which covered 'a great quantity of imperfectly burnt bone chiefly at the sides and in the corners', seven flint implements as well as flakes and chips of flint. The sand forming the basal layer was fire reddened and contained large pieces of charcoal, and the ground surface appeared to have been subjected to considerable heat; it is possible that the other two compartments had been similarly affected. Situated some 2m to the SW of the chamber there is a cist, aligned NE and SW and projecting above the cairn material; it measures l.2m by 0.8m and 0.6m in depth, and the bottom 0.2m is now filled with rubble. 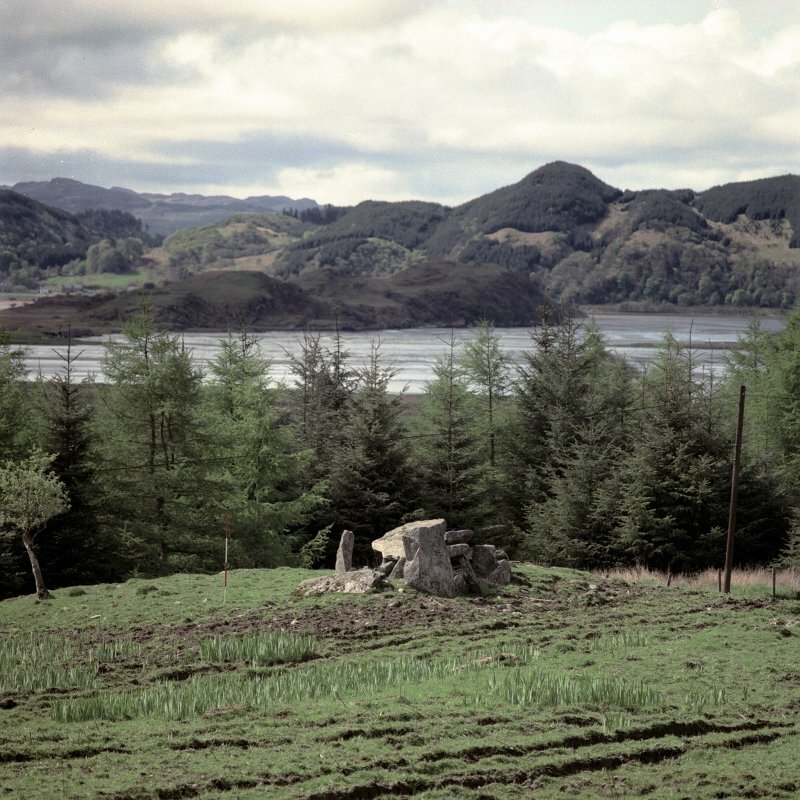 The NW side-slab is missing, but it was present at the time of Mapleton's excavation; there are two slabs at the NE end, one set behind the other. The capstone, which partly overlies the SE side, measures 2.3m by l.4m and 0.2m in thickness. The cist produced 'only one or two pieces of charcoal among the sand'. The Food Vessel is now in the West Highland Museum, Fort William, and the surviving flint implements are in the Royal Museum of Scotland, Edinburgh.